UFC’s first trip to Sweden provided an exciting night of fights and successful set of predictions. Alexander Gustafsson, Brian Stann, and Dennis Siver were just a few of the big winner at this event that featured six submissions and a pair of knockouts. Overall my predictions finished with a solid 7-3 record, including a 5-1 main card record. The Kamikaze Overdrive Betting Pack was a huge success with multiple winners including an almost perfect record on the Single Bet Confidence List and a pair of winning parlay bets (check out the results below). -Francis Carmont looks like a beast, but will best tested with a next level opponent next time out. -DeBlass had success early, but his cardio gave out probably because he t0ok the fight on short notice. Although the outcome of this fight wasn’t what I wanted, I did suggest a small bet on a Siver/ Diabate combination in the betting pack and suggested avoiding a bet on DeBlass. -Abedi will most likely be cut, hurt on the feet and submitted twice for an 0-2 start. James Head could create some interest at 170 going forward. -I hope Damacio Page sticks around, he is an exciting figther. Brad Pickett looked good, with a couple more wins he could find himself right back in the title hunt. I always enjoy watching him fight. – John Maguire looked good and was percistent on the mat despite Johnson working hard to defend. Maguire vs Head? -Bahadurzada welcome to the UFC, huge win over a tough guy. Even though his knockout was impressive, I still want to see him tested in fight that goes longer then a few seconds before I’m 100% sold on him. – Stann has big power, a knockout from the guard like that is nothing to overlook. He can handle himself against any striker in the division not named Anderson, but his struggles with wreslters/grapplers will determine how far he will climb. Stann vs Herman? -Alessio Sakara’s injury trouble and failing chin could bring about his retirement. -Gustafsson looked good and will most likely fight for the title by early 2013 barring injuries or rematches getting in his way. He has a lot of tools and his size makes him a marketable challenger for Jones (if he is still the champ). I would like to see him pick up one more high profile win, maybe against Little Nog or Ryan Bader to help get him over as a title contender. 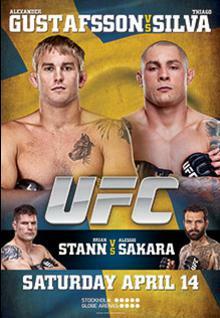 – excellent show overall, enjoy it start to finish now on to UFC 145. Silva is tempting at $2.85, but returning from a layoff can have an huge impact on a fighter performance, plus if you take into consideration that he took this fight on short notice the bad far out weighs the good. Gustafsson isn’t a bad play at $1.44, but get him before he drops too far. If he moves down into the low $1.30′s you might want to look elsewhere to invest your money as the risk/reward becomes a little bit concerning. Stann perfectly fits the profile of the power punchers that has given Alessio problems in the past. Sakara is coming of another injurt and a long period away from action which is properly reflected in these odds. I feel confident that Stann wins this fight, but at $1.25 he might be better used as part of a parlay then as a single bet investment. Consider doubling him up with Gustafsson. Thiago has never been stopped, struggling for the most part with opponents that could handle his ground game, which I don’t anticipate Siyar being able to do. Thiago has good value at $1.60 and is worth a single bet, but with Siyar debuting we don’t know how he will react. He could rise to the occassion and put together his best performance to date, and if he is able to defend the takedowns this fight gets turned on its head. A debuting fighter is always a risk, but a small bet on Bahadurzada at $2.37 wouldn’t be a bad idea. The biggest question mark is how will Siver handle the weight cut. If he is able to transition well and beats Nunes this will probably be the last time we see Siver as the underdog at FW (unless he gets a shot at Aldo). I like Siver as the dog at $2.30, but the weight issue makes me hesitant. Nunes is a Top 10 FW and getting him at a $1.63 is a good deal, but again there is a huge unknown looming over this fight. To avoid lossing a tonne of cash, consider a small bet on Siver as part of a parlay. Use his $2.30 to beef up some of the lesser odds, but don’t make him the focal point of your larger investments until he can prove himself at this new weightclass. I was really shocked when I first saw these odds. I was anticipating the lesser known Maquire to be the underdog around the $2.10-$2.25 range, especially with the brutal KO Johnson had in his last fight. If Johnson can keep this fight standing he is worth the $2.40, but when I reviewed by last set of notes for his fight with Amir Sadollah I kept finding the same thing: Johnson struggles to defend the takedown and the stats back it up. Maguire should be able to exploit this and even though he doesn’t have the $2+ return, at $1.59 he is worth a look. Pickett is a solid veteran that can hang with anyone in the division, while Page just doesn’t strike me as a worthwhile bet against anyone in the Bantamweight Top 10. He is an exciting/ aggressive fighter but that doesn’t always equate to victories. I like Pickett in this fight, I like him at $1.46 and suggest you get on him before that price drops. Abedi $1.41 vs Head $2.95- Abedi showed a lot of confidence in his last fight despite facing his big challenge in his debut. I like him here, especially with Head making his first cut to 170. Wisely $2.65 vs Young $1.49 I this this will be an entertaining bout, both guys need victories and I think Young paying $1.49 is a pretty solid bet. From the footage I have seen he should be the stronger figther and if he gets the better of Wisely standing I don’t Wisely being able to take him down. Diabate $2.77 vs DeBlass $1.46 Diabate is worth a look at $2.77, maybe a parlay with Siver ($2.77 x $2.30 = $6.37) so you can limit what you risk and still get a nice return if they both cash. These odds reflect that DeBlass is a grappling based fighter and Diabate has had issues with grapplers, but DeBlass is debuting, stepping up in competition, and taking this fight on short notice. These factors create to much concern, so my suggestion is to not bet on this fight as part of your main investments. Carmont $1.50 vs Cedenblad $2.60 Carmont looked dangerous in his first fight and should do even better here. Cedenblad got this shot because they are fighting in Sweden and I think it shows up here. I’ve watched a fair bit of footage on Cedenblad and I don’t see an area where he can threaten Carmont, don’t be suprised if his value drops closer to fight time. Brad Pickett by Submission- Pace has had issues with getting subbed and Pickett is more then capable, especially if Pace gets tired. Maguire/Johnson Total Rounds Over 1.5- this bet might have some value, especially if the books anticipate a submission win for Maguire. Johnson might not be able to defend the takedown, but working with Jeremy Horn should help him to defend the submission attempt resulting in this fight going into the second half. Siver/Nunes Total Rounds Over 1.5- Both guys have knockout power, but I could see this matchup going the distance. There should be value in the over because of the threat of a knockout on both sides.